When Kyle Dudley and Michele Lalonde’s first-dance song began to play, they were the only ones who knew it was time. They had agreed to find each other and share the moment together. No drumroll, no announcements, no fanfare. “Kyle was just like, ‘When you hear the cue of the song, I’ll be on the dance floor and you come meet me, and that’s exactly what happened,’” Michele remembered. A few guests caught on and watched them dance, but the ritual was anything but forced. That was the two DIY-ers’ top priority as they planned their wedding together. Kyle is a senior construction manager and co-owns a woodworking shop in Virginia called Square & Chamfer, and Michele is a home decorator. 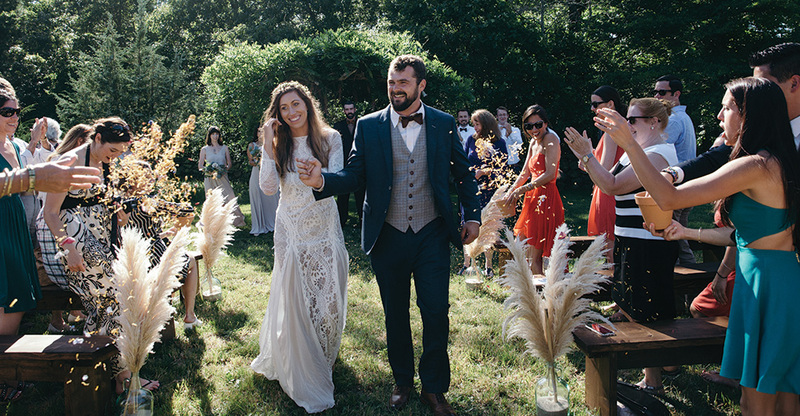 Their crafty, boho wedding was to be a relaxed celebration, free from a tight schedule, free from choreography, and most of all, free from a seating chart. “It was one of my shticks from the beginning that I didn’t want assigned seating,” Michele said. At their celebration at a rented West Tisbury home, guests chose their places at long farm tables, each named for a different Island town. Kyle has family on the Vineyard, and has been summering on the Island since he was young. 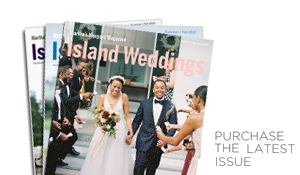 Most of Michele’s family lives in Canada, so the Island became a meeting point between their northern roots and their current home in Virginia, the perfect place to begin married life together. The wedding was full of personal, handmade details. After the ceremony, guests showered the couple with dried flower petals and walked a path lined with wedding photographs of the couple’s parents, grandparents, and great-grandparents on their way to the cocktail hour. Kyle and Michele's mothers made their childhood favorites for the dessert table. Michele assembled decorative garlands with friends and family. Kyle and his groomsmen wore custom wooden bow ties from Square & Chamfer. Their Best Advice: “Spend time exploring all the hidden gems of the Island. Get a feel for the type of vibe you want to have. Martha’s Vineyard can offer many different styles from rustic, to beachy, to traditional. We love that about the Island. Not to mention scouting out all the best secret spots for your photo shoot will really pay off in the end." Where'd they get that truck?? ?